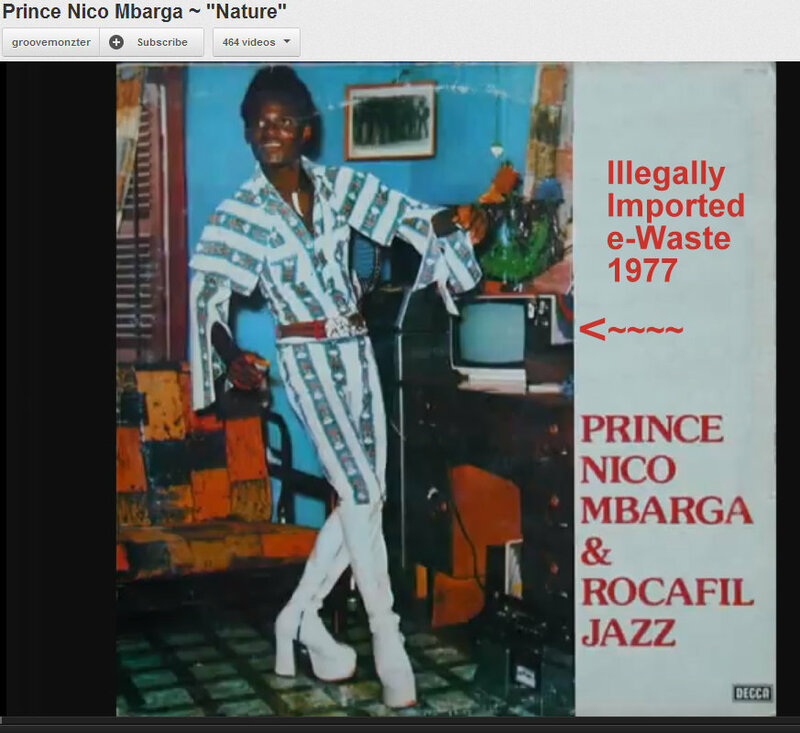 Good Point: Ethical Electronics, Recycling "e-Waste" Blog: Oxbow Incident: Lord Chris Smith, Interpol and BAN vs "Waste Tourists"
My landlord was not the first African to own a TV... Prince Nico Mbarga had a television, shown above, on his 1977 Rocafil Jazz album cover. The same color, size, and perhaps make, as the television ported on the scrap kids head in Waste and Recycling News (below). Below are some scholarly links to key events that sucked David Higgins, Lord Chris Smith, and James Puckett down the rabbithole of false assumptions which put an innocent UK Man, Joe Benson of BJ Electronics, into a prison cell. I do not accuse any of these men of being a racist, I do not think they intended any injustice. But environmental malpractice is now a term we must account for. This theory of "waste tourism" started when I made the grave mistake of entrusting information to Jim Puckett of BAN in 2004, when I thought sharing information would lead to a more nuanced approach by Basel Action Network (we previously worked together on "toxics along for the ride" or the CRT Glass Test, which I intended to acknowledge the valuable items were the driver). But I was caught off guard when, a few months later, BAN had taken my information and flown to the markets I told them about in Nigeria... and published an alarming paper called "Digital Dump: Exporting Reuse and Abuse to Africa". In the "Summary of Findings" BAN appears to recognize the quality of tech repair, but calls them underpaid (Manhardt later shows them to make several times the average Nigerian wages) and claims "up to 75%" of imported containers - 500 containerloads per month - were junk which would be burned, in violation of the Basel Convention. He made the statistic up of whole cloth, and later denied it, but to this day believes it was for a good cause - describing (to me) Joe Benson as "collateral damage". A very respected scientific writer from NIH, Charles Schmidt, reviewed the "Digital Dump" report and then interviewed both Puckett and I about exports to Africa. Jim convinced the researcher Schmidt that "most" of the exports to Africa were simply dumped. 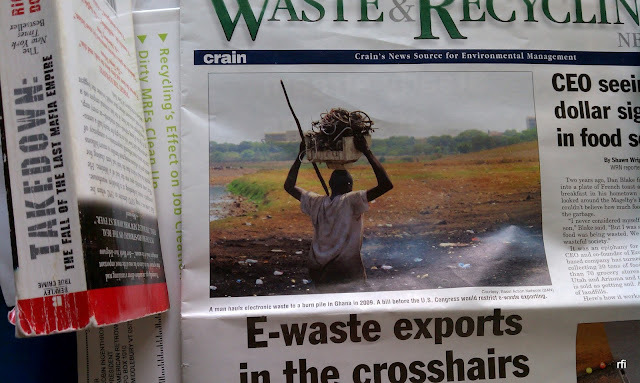 Unfair Trade of E-Waste in Africa. I responded with my #1 read blog, "Monkeys Running the Environmental Zoo", but it was too late. Puckett promoted the NIH article. The USA GAO took up the cause, and interviewed me afterwards for a report "Harmful US Exports Flow Virtually Unrestricted" in 2008. I directed them to Alibaba and Recycle.net and other online trading sources, thinking they'd learn about the trade that way - that no one would ever purchase BROKEN CRTs. Instead, the authors posted a "Wanted, BROKEN CRTS" ad, explicitly accepting all the anti-PAT test and other disqualifying IFIXIT criteria, offering to pay $10 per broken, ruined CRT. They did find people were willing to SELL them the broken stuff, and reported that as proof of lack of enforcement by EPA. But that's a bit like posting an ad to pay $10 per piece of dog poop, and citing that as evidence that Joe Benson may be buying dog poop to dump in Africa. We agree there are people willing to sell their dog poop to Africans, but doubt it makes up a significant percentage of African trade or dog poop diversion. There has to be some latin name for that, but I'd call it entrapment. I was a bit proud that I saw the fake ad, was confused as hell by it, and warned the "Chinese" (as they posed) buyer that they better change their ad or they were going to wind up with unrepairable CRTs... and there's no way those were worth $2, much less $10. The GAO Report led to a study by Michigan State University, cited by a young Interpol staffer (just out of college) Emile Lindemulder [correction degree 1997, appointment 2000]. Lindemulder went on to interview Puckett and put together a very influential report (Electronic Waste and Organized Crime Assessing The Links 5/2009) describing the "80% primitive" export industry (the worst environmental study ever written). The logic of Lindemulder's progression from "payment" meaning "organization" therefore "organized crime" would be laughable if the results were not so painful. Lindemulder specifically identifies the UK - BJ Electronics home country - as a major exporter. In his defense, Lindemulder relied heavily on the horrible set of research by Michigan State University, which was eventually published by Mark Axelrod, Carole Gibbs, and Edmund McGarrell ("Transnational white-collar crime and risk: Lessons from the global trade in electronic waste") Criminology & Public Policy 9(3): 543-560 (2010). MSU essentially found that if there are Japanese cars in USA scrap yards, it's evidence that Japan is dumping on the USA - and any car imports from Japan are suspect. The "waste tourist" hypothesis reigned in 2008-09, and Katharina Kummer Peiry was in charge of Operation Demeter in cooperation with Interpol and LCS. In a 2009 slide show she gave in Cairo, she framed the commodity vs. waste balance with photos of CRT monitors sent to Thailand... not aware of the SKD or Semiknockdown factories in Thailand which were still purchasing them for reuse. BAN's Annual Report 2010 (09 also interesting) praises itself for its influence on governments to enforce against the pollution. The #povertyporn photos festooned on the report would lead a legitimate donor to believe a dime went the way of the African kids. An article from American Shipper covered Operation Demeter the following year, complete with Photos by Jim Puckett and Puckett quotes lambasting ISRI. Statistics on the 86 seizures in the first year, using CRTs as an example, on page 13. Same Lord Chris Smith, Emile Lindemulder, Jim Puckett meetings... this is from the early days when the "entrapment" - taking a nice looking TV that is statistically very easy to find parts for - and sabotaging it, then buying it back for 10 times more than the scrap value because the marketplace in Lagos knows its value. Today there's a deafening silence, as a result of the study of the seized containers, in the two reports. The curious lack of interest by BAN.org in Joe Benson's sentencing... an eerie silence. He knows what they found in the seized containers. TVs like the one sold to my landlord in Cameroon in 1986.
passed on to collectors and recyclers. Basel Secretariat also released the report-on-the-report which is slightly more critical of the imports, claiming 85% are reused (a factor of rounding Manhart data), but it still has plenty of charts showing the same thing you've seen in China - massive urbanization and spikes in Africans owning PCs and TVs and the percentage of imported waste appears small. As this process went forward, Mr. Benson continued to fight his case and to try to salvage his business. I saw a BAN slide show by Puckett when we were presenting at a Las Vegas Conference in December 2012, and Puckett showed the Cahal Milmo article about Joe Benson's arrest. I blogged from the conference, Env Malpractice Free Joseph Benson begging Jim to come clean, that a guy faced jail, when BAN had the 91% Reuse e-Waste Assessment study. I actually stole a copy of Puckett's draft presentation on the UNEP study when we shared the powerpoint laptop, and can see him trying to massage the "improvement due to BAN's attention"... but he didn't present those slides, can't seem to figure out how to acknowledge the mistake. Katherina Kummer Piery, now retired from her position at Basel Secretariat, has done the most to reassess the statistics. She publishes an honest blog about the evolution of her perceptions on e-waste, she volunteers on the R2 certification board of directors, and participated in last year's Fair Trade Recycling Summit at Middlebury College, to date the most refreshing and honest discussion of the exports, environmental justice, and philanthropic colonialism. Earning over a million dollars per year on its charitable-industrial complex, Basel Action Network is finding it hard to budge on the "mob lynching". Here is a recent BAN slide show showing photos taken in Africa, which is remarkable because they STILL use the 80% of E-waste exports, and show a photograph of Africans with electric multimeters actually repairing CRT monitors... they clearly don't know what they are photographing. But they do acknowledge the difference between the Basel Ban Amendment and Basel Convention. The "waste tourist" hypothesis, that says criminals come to Europe to buy "waste" for burning, never made any economic sense. The original Interpol report by a very green Emile Lindemulder stating these were "organized crime" was shared directly with Lord Chris Smith. This led to the seizure of the containers (like Bensons) under Kummer's Demeter operation, which were then studied by Manhardt et. al. This was a modern, high tech, environmentalist, well meaning, lynch mob. This was the Oxbow Incident (if you read US Western literature, or know the 1943 Hollywood film. 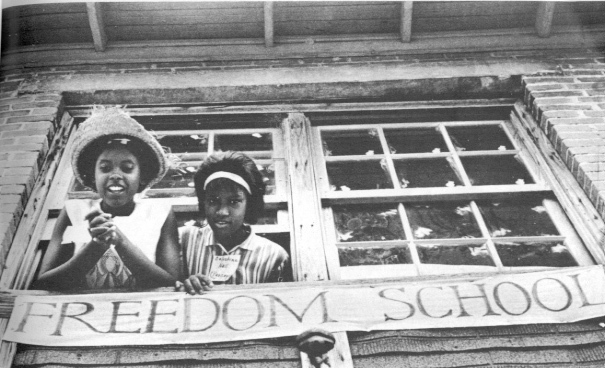 Now it's time to copy the actions from Freedom Summer, for USA college students, and European students, to embrace people like Joe Benson, to march with the geeks of color. Fair Trade Recycling or WR3A.org is a good place to start. Colleges and Universities, please export to people like Joe Benson. You will find they don't actually want "waste". They want to buy things they can use and fix, creating the best jobs in Africa, and building mass communication and education through reuse and repair, the only way to wire Africa without mining tantalum from the Congo. Lindemulder graduated a Master of Science in both environmental sociology and ecotoxicology at Wageningen University in 1997. He joined the National Environmental Crime Unit of the Netherlands Police in 2000. So in 2009 he was hardly 'fresh out of college' and had nearly a decade of experience in criminal law enforcement. Thanks, he seemed young when I met him and had not to my knowledge travelled to any of the geographical sites he described in the 2009 paper, but I appreciate you correcting me.